Below are the final player rankings using the F.SCORE metric - determined on underlying statistics only, mostly shot data, and not counting actual goals scored or assists at all. Through the season these rankings were done on an average basis, as long as the player had featured in half of the available minutes. For the end of season rankings though I've done both the average score, and cumulative. First the rankings by average F.SCORE per game. F.SCORE this season has a correlation with FPL points of 0.963* which makes it an excellent indicator when wanting to know which players are scoring points for a reason and which just get lucky for a few games. Remember it's based on underlying stats only (the process) and the actual game points count results only (the output of the process). In a post next week I'll go over some of the highs and lows of the FSCORE model this season and which players over or underperformed the stats model. 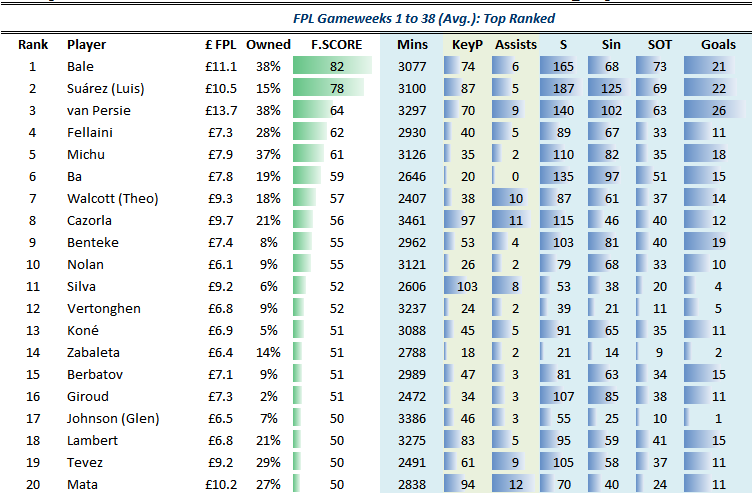 That's quite brilliant actually, well done to figuring out a relatively accurate underlying gauge of FPL performance. When you have the time, perhaps to improve your accurace you'd want to get the correlation figures for early season (Aug - Nov), the end of year hectic schedule and end of season to get a more realistic figure? I am aware that you did mention over/underforming players in the stat model, but perhaps phases of the season also plays a part in the analysis, hope you get what I mean.